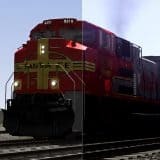 Are you a fan of Train Simulator 2017? Then you should definitely check our Train Simulator 2017 Passenger Wagons Addons. We have a great collection of various files, which help players around the world to accomplish their tasks faster. Train Simulator 2017 Passenger Wagons Mods is a great solution, if you are struggling with some particular task and would like to overcome all boundaries faster. Then find the features you need and just press on Train Simulator 2017 Passenger Wagons Addons download. So, simple and easy! If you have ever dreamed of creating your own version of the game, Train Simulator 2017 Passenger Wagons Mods free files are the perfect solution. Why not to try TS 2017 Passenger Wagons Addons, if they are costless? Enjoy as much as you like – TS 2017 Passenger Wagons Mods will definitely surprise you and your competitors. Could you even imagine a better scenario? Sure not!